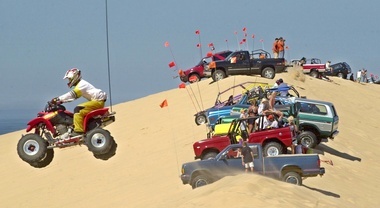 State parks chief Ron Olson and Sen. Geoff Hansen (upper right) discuss the issues as ORV enthusiasts form groups and attempt to develop solutions. Photo; Howard Meyerson. MEARS, MI – Ron Olson stood in front of a packed house, his tall, lanky frame towering over many who listened intently. More than 200 off-road and dune-buggy enthusiasts poured into Golden Township Hall on this frigid January night to talk about Silver Lake State Park. Nearly half had driven more than 100 miles. Olson facilitated the meeting looking for solutions to the traffic backup that occurs on holidays and weekends. The park implemented a free voucher system in 2012, thinking it would solve the problem. 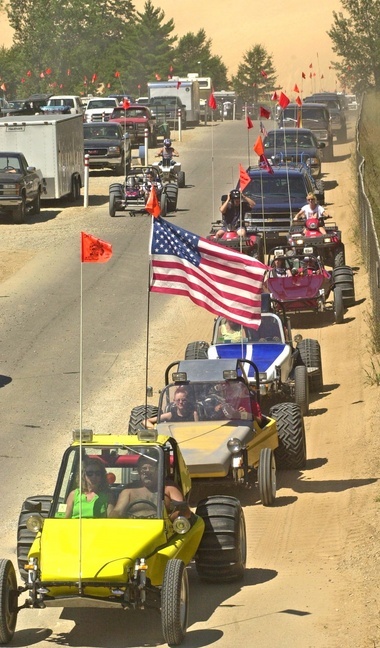 About 120,000 to 130,000 vehicles use the ORV scramble area every year, according to the state Department of Natural Resources. The line at the gate can be four miles long. 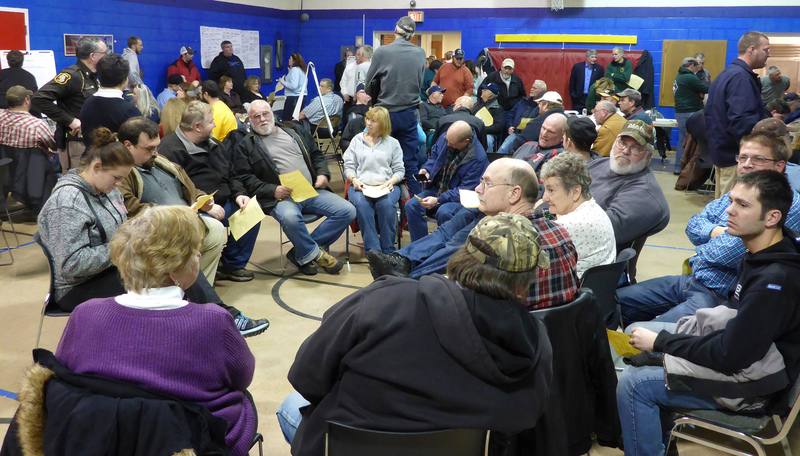 The evening wasn’t a typical public meeting, full of vitriol and chaos. Olson wouldn’t have it. He asked attendees to form groups, to participate in a deliberated process to identify how to make the system work. He urged respect for one another, listening and giving everyone a chance to speak. Area legislators — state Rep. Jon Bumstead, and state Sen.Geoff Hansen — offered opening comments about working with the DNR to make sure they get it right. The meeting was convened because of outrage that was triggered when the DNR earlier proposed putting the park voucher system online and allowing advanced reservations for a $10 fee, (later reduced to $3). State park officials thought the approach might reduce the lineup. But the push-back was strong. People didn’t like paying for what had been free. And even if they could abide by $3 to cover reservation costs, many were concerned advance registration could result in some being excluded from the park if fewer vouchers were available on site. As a result, the decision was pulled from the January Natural Resources Commission agenda where it was supposed to be approved. Many in the crowd made it clear they didn’t want vouchers at all. They wanted a dune-ready entrance for those who arrived ready to go, more bathrooms and bigger parking areas, something Olson suggested might not be possible because the site is a critical-dune area. The evening process took two hours and closed reasonably. Olson had the groups present their wishes to the crowd; he invited anyone who was interested to sign up and participate on a task force he would convene to review the ideas and work with the department on a new solution. Olson assured that would happen, saying he was looking for a good solution. This entry was posted in Uncategorized and tagged Conservation, DNR, Mears, Michigan, Michigan Department of Natural Resources, Nature, ORVs, Sand dunes, Silver Lake State Park, State Parks. Bookmark the permalink.